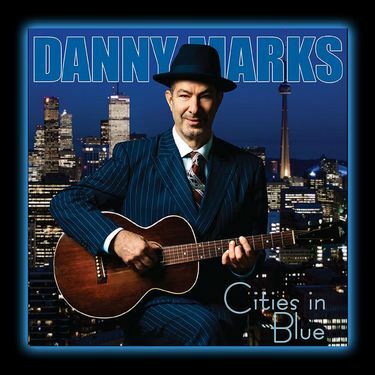 I just received the newest release, Cities In Blue, by Danny Marks and he covers a lot of blues territory from coast to coast. Opening with a super T-Bone Walker style track, Houston to L.A. Danny Marks handles vocals and displays his strong capability to swing that guitar. Very nice! Belt Line Blues has a rural country style with Al Cross on drums, Danny Marks on slide and Johathan Goldsmith on keys. Once I Was Crazy has a great period feel highlighted by strong riffs from Chris Whiteley on trumpet and Ken Whiteley on Banjo. Very cool. Swing track, Kansas City Shout, has a real nice piano line by Julian Fauth and Marks with Alec Fraser on vocal backed by Mike Wark on sax is super. I'm particularly attracted by the guitar intro on Memphis Got Soul which has nice Albert king blues influence and the solid bari sax work by Phil Skladowski gives it that Memphis horn sound. With a light springy rag style, Heading Down To New Orleans, strongly features Marks' vocals and nicely blended vocal backing. Blues Came To Chicago features David Rotundo on harp and Bucky Berger on drums. Going Down The Road maintains it's revival feel but with mandolin and percussion has more of a primitive feel. Chris Whiteley on harp and Chris and Ken on backing vocals does give it a honest sound. Hey, New York Town has a more modern sound with contemporary guitar playing, organ work by Jonathan Goldsmith, beat by Piltch, hip hop style vocal phrasing by Marks and backing vocals by Sherie Marshall. Land Where Blues Began has a very raw instrumental style with Marks on slide guitar, Marks on acoustic, Al Cross on light percussion and Fraser and Marshall on backing vocal. Wrapping the release is Lights Out, a slick jazzy instrumental number with an almost a beach feel but holding onto the blues, Otis Rush style. Possibly my favorite track on the release and a super closer. Great review, nicely done BMan and glad you like Cities in Blue! My brother Rob Piltch would be amazed to be credited with the slide guitar. After all the Fred McDowell lessons I took, a confession must be made : It was I. Next album I'll be more careful with the liner notes. Love You Large! Hi there. I'm not sure that Mike Wark played baritone sax on this recording. Might want to check the liner notes again. Phil Skladowski played Bari, the big one! Thanks guys. I do my best with the notes. You do great work Bman, we're grateful to see a person who cares spreading the good word about music.